Curvorama display graphics are lightweight rollable panels which are easy to assemble and above all, look great. Curvorama graphics can be fitted with either legs and feet that allow the panels to be free-standing or alternatively they can be supplied with Shell Scheme adapter clips that allow the panels to hook over most shell schemes and sit side by side to create the impression of a continuous backwall diaplay. 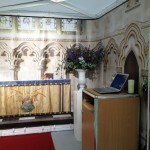 The Church of England approached Printdesigns to come up with a solution whereby they could model the inside of a typical exhibition shell scheme to represent the inside of a Church. For previous exhibitions, a series of foamex panels were used which had to be attached to the wall with batons. The installation of such rigid display boards proved time consuming and costly as an exhibition stand contractor had to be appointed to both transport the large bulky panels and install/dismantle them at each event. 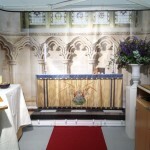 Printdesigns helped by advising the correct amount of Curvorama shell scheme panels for the shell scheme and created artwork in the form of a ‘virtual church’ by stitching together a series of supplied photographs into final print ready artwork. Printdesigns were one of the first exhibition and display companies in the UK to supply the Curvorama display system. Thanks to our experienced design team and in-house print facilities, we can offer the best service and prices on Curvorama display stands.